It’s a SHORT, SHORT STORY up to now – the history of the Parish of Lady of Fatima. But it is the story of a year’s solid achievement, of creating a strong foundation for a glorious future. Institution of the Parish and the well-ordered plans for its growth form one segment of a community design that will made Modesto, within a few years, the civic, commercial and cultural focus for 70,000 people. The Church is not behind in its part of that future. Such planning is not new in the eighty years of Modesto’s life. The city stands today in an area rich in potential gifts of almighty god, but man’s ingenuity had to be applied for many patient years before those gifts could be realized in bountiful and unfailing harvests, and in opportunities for gracious living for thousands of families. Modesto’s plans call for investment of today’s prosperity in a better tomorrow. They look for continued progress of the kind which has brought millions of new residents to California, many thousands of them to Stanislaus County, since 1940. 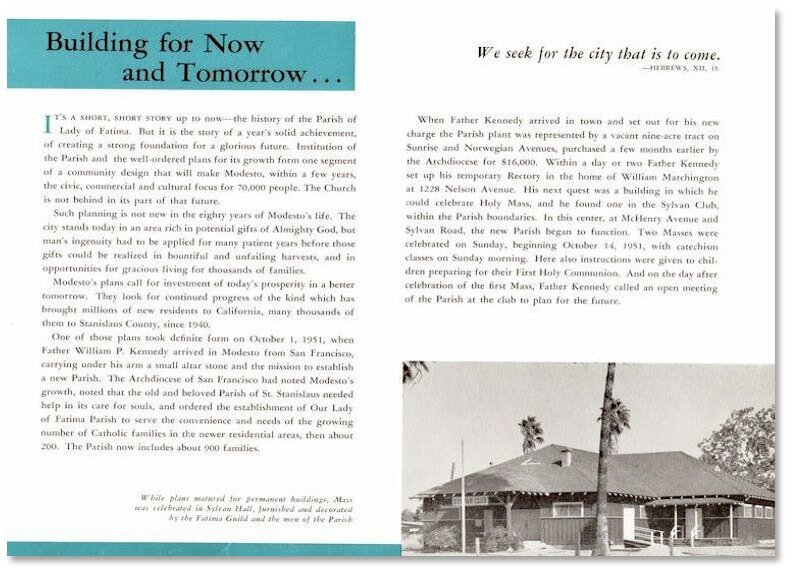 One of those plans took definite form on October 1, 1951, when Father William P. Kennedy arrived in Modesto from San Francisco, carrying under his arm a small altar stone and the mission to establish a new Parish. 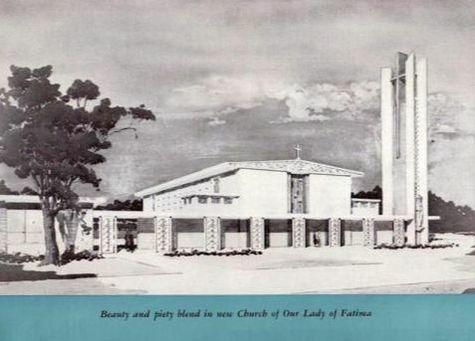 The Archdiocese of San Francisco had noted Modesto’s growth, noted that the old and beloved Parish of St. Stanislaus needed help in its care for souls, and ordered the establishment of Our Lady of Fatima Parish to serve the convenience and needs of the growing number of Catholic families in the newer residential areas, then about 200. The Parish now includes about 900 families. When Father Kennedy arrived in town and set out for his new charge the Parish plant was represented by a vacant nine acre tract on Sunrise and Norwegian Avenues, purchased a few months earlier by the Archdiocese for $16,000. Within a day or two, Father Kennedy set up his temporary in the home of William Marchington at 1228 Nelson Avenue. His next quest was a building in which he could celebrate Holy Mass and he found one in the Sylvan Club, within the Parish boundaries. 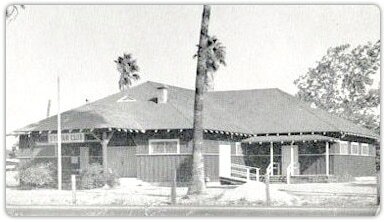 In this center, at McHenry Avenue and Sylvan Road, the new Parish began to function. Two Masses were celebrated on Sunday, beginning October 14, 1951, with catechism classes on Sunday morning. Here also instructions were given to children preparing for their First Holy Communion. And on the day after celebration of the first Mass, Father Kennedy called an open meeting of the Parish at the club to plan for the future. furnished and decorated by the Fatima Guild and the men of the Parish.